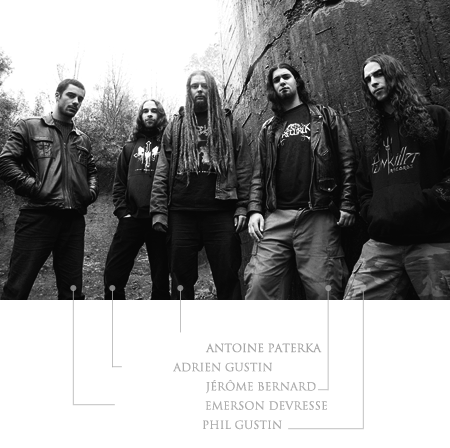 Pestifer is a death metal band founded by twins Adrien Gustin (bass) and Phil Gustin (drums). The twins met Antoine (guitar) and after sharing their ideas they started to play together. The line-up is completed with Morty on vocals and the band has about 10 songs. Pestifer record their first demo and play live everywhere they can. A good energy seems to emerge from these concerts. At the end of 2006, the band decides to part ways with Morty. The guys still play some gigs with session vocalists also record a song called «Involution Process», for the deathmetal.be sampler: «FYU Volume 5», featuring Panda (ex-Pitbulls in the Nursery) on vocals. The compilation is distributed throughout Europe and helps Pestifer to be heard internationally. Pestifer find a new rehearsal room and recruit two new members, Emerson (guitar) and Jérôme (vocals) and the quintet writes some new songs. Back from the grave, the band plays live with the new line-up but the ultimate objective is recording an album. During September and October «Age of Disgrace» is recorded with Jérémy Stoz at Mammouth Production studios and the mix is completed during November. The new album is done and the second track «Contagious» is selected to appear on «FYU Volume 8» sampler. Meanwhile «Sleepless Century», the third track, is featured on the «Combat Nasal» sampler. « Age of Disgrace » received a lot of great feedback from zines and fans, they all seem to be very enthusiastic about the future of Pestifer. The band starts to play more interesting gigs like Metal Mean festival with Mayhem, Macabre, Devourment and Rotting Christ. The 5 guys win the Metal Mean contest. They also open for Watain and Deströyer 666. The new album is recorded and mixed by Jeremy Stoz. This time, Victor Bullok (Pestilence, Obscura, Triptykon) takes care of the mastering. The band gets a new deal with Great Dane Records. The kwintet plays few concert in Belgium, Luxembourg and France and shares the stage with Exhumed (in Lille) and Channel Zero (in Flemalle) few weeks before the tragic death of their drummer. During September, Pestifer run a new European tour with Nile, Ex deo and Svart Crown. They play 13 gigs across England, Scotland, Ireland, Wales, France, Germany, Belgium and Netherlands.